Weekends spent watching sports has become an American tradition. What’s more American than a good old juicy hamburger? 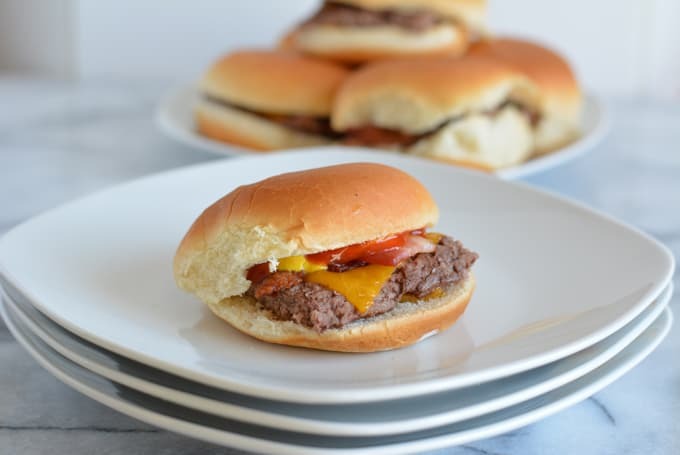 Sliders are a perfect game day snack that won’t leave you feeling stuffed life regular sized burgers. 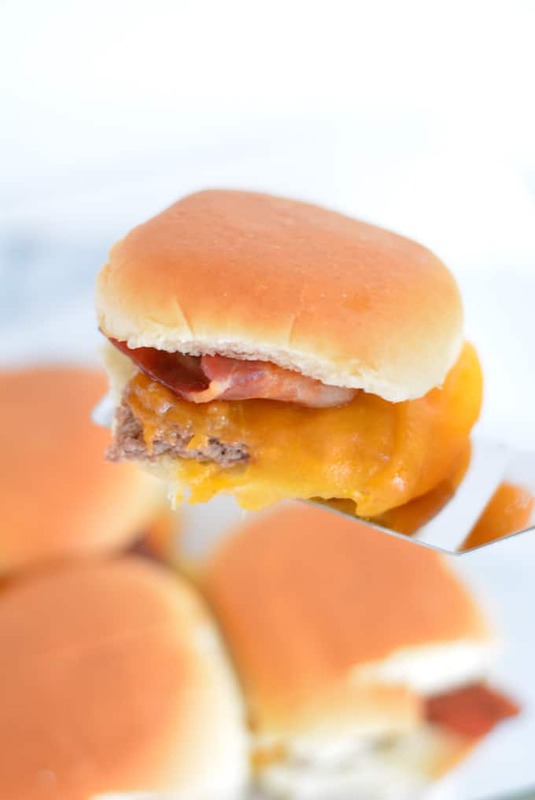 These easy bacon cheddar cheeseburger sliders are baked, so you don’t have to stand outside grilling and miss the action. This post is sponsored by Pepperidge Farm, but all the content and opinions are my own. I may be a dietitian, but I love a juicy burger. Who doesn’t? I can never finish a regular size burger though. Sliders are a perfect portion for me. 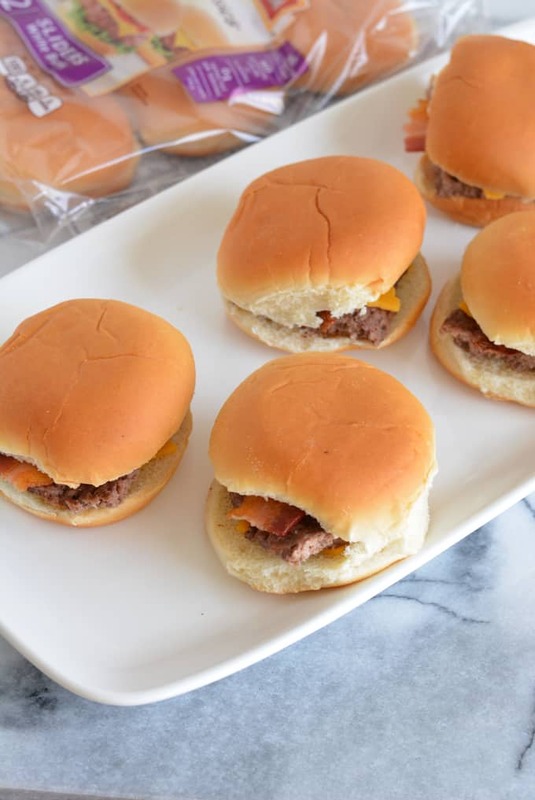 Sliders are also the perfect Game Day snack to serve at your next football party. You can make different varieties or set up slider bar and let your gets choose which slider they want to build. Slider rolls are not always easy to find. Thank goodness for Pepperidge Farm. 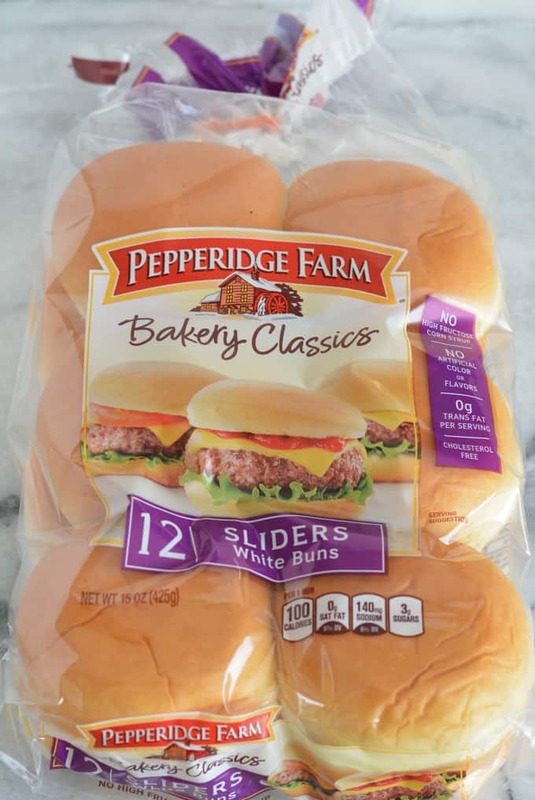 Pepperidge Farm Slider Buns are available in many local markets. The store locator on their website is very helpful because you can search to see which stores carry the variety you want. Pepperidge Farm has several varieties including white, whole wheat, Sesame, Sweet & Soft, and Golden Potato. Pepperidge Farm Slider Buns contain no high fructose corn syrup and no artificial flavors. My hubby and son usually enjoy buffalo wings on game day. I don’t care for buffalo wings because they are too spicy and too messy. My 41-year-old tummy can’t handle anything spicy. When I added cheeseburger sliders to the menu everyone was happy. Our other game day favorites include Philly Cheese Steak Bites, Veggie Loaded Taco Dip, and Gruyere Mushroom Turkey Burgers. The best part about these sliders is the beef is baked. There is no need to stand outside and grill burgers. In Pennsylvania isn’t just too darn cold right now to do that! You can let everyone build their own cheeseburger sliders or prepare them like I did. I love gooey cheese, so prefer to warm the assembled sliders in the oven. The cheese will be nice and gooey and the buns will be slightly toasted. Just look at that yummy cheese! You add additional condiments of course. I like to keep my burgers basic with just adding a bit of mustard and ketchup. 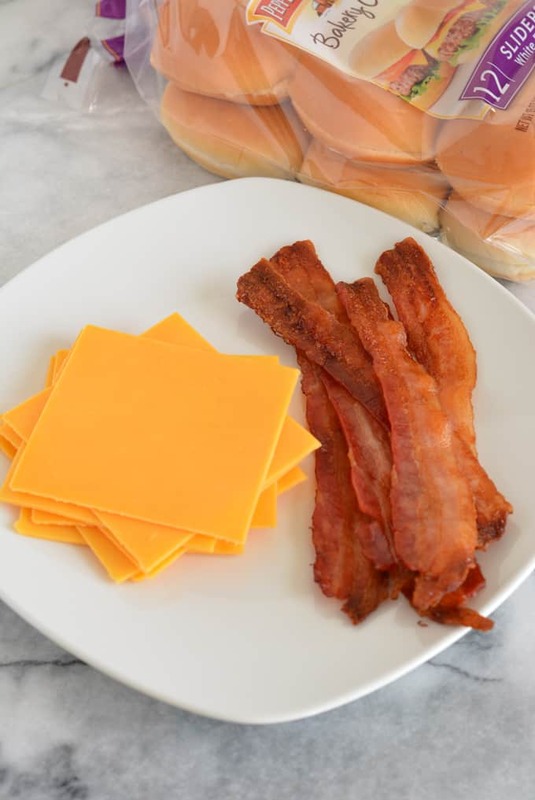 Easy Baked Bacon Cheddar Cheeseburger Sliders are a perfect Game Day snack. Spread ground beef evenly on the bottom of the 13 x9 inch pan. Season beef with a pinch of sea salt and pinch of black pepper. Bake ground beef for 20 minutes or until internal temperature reaches 160 degrees F.
Remove ground beef from the oven and carefully drain off juices. Cut ground beef into 12 sections. 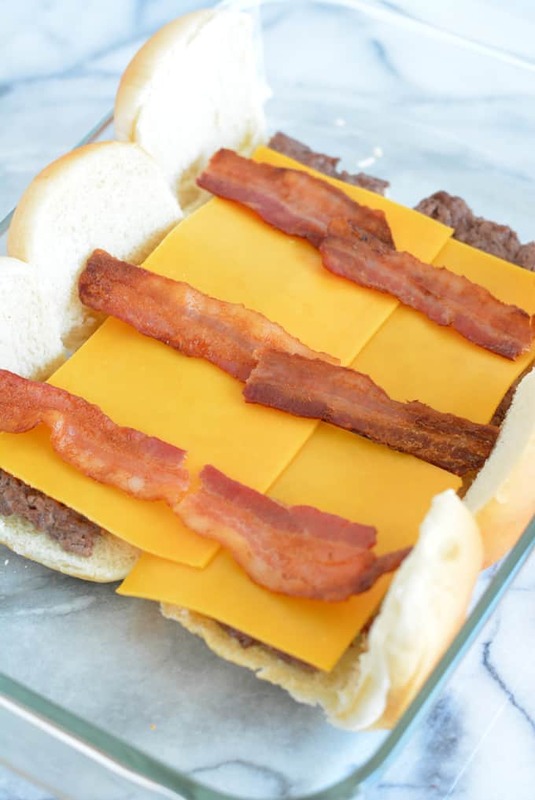 Place one patty square onto each of 12 slider rolls. 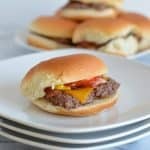 Top beef patties with cheddar cheese, bacon slices, and slider tops. Cover pan loosely with foil. Place slicers back into the oven to warm until the cheese is melted (about 3-5 minutes). What’s your favorite burger? Let me know in the comments.